Zhong Ziqi, sometimes called Zhong Qi, sometimes Ziqi,4 here seems to be a gentleman, like the man with whom he is famously associated, Bo Ya; the picture at right is in keeping with this description. 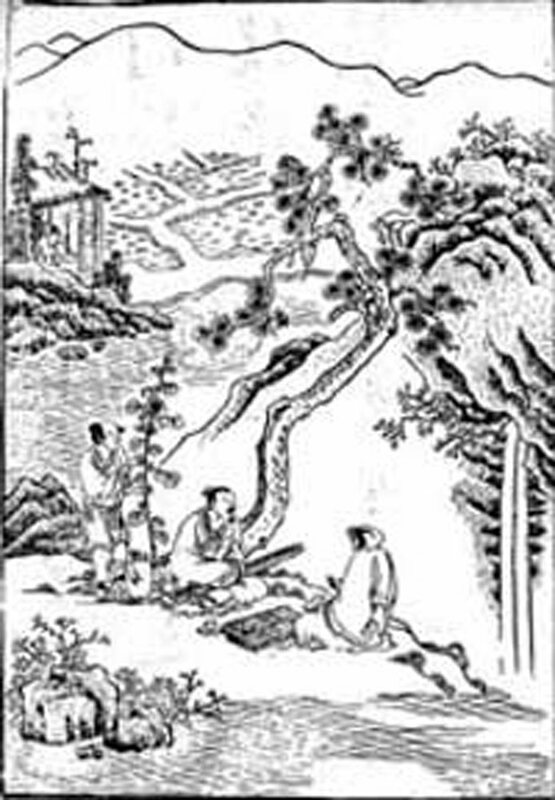 However, the story best known today describes Ziqi as an ordinary woodcutter,5 nevertheless able to recognize what was in the heart of Bo Ya as he played the qin. When Ziqi died, Bo Ya broke the strings of his qin and never played again.6 He felt that in life you were lucky to find one person who understand you. He had found that person in Ziqi, so when Ziqi died, there was no reason to play the qin any more. This story is in particular connected to the qin melodies Gao Shan (High Mountains) and Liu Shui (Flowing Streams). The qin song Boya Diao Ziqi focuses on their friendship. Qin illustration 11 in Taiyin Daquanji says it is a depiction of Zhong Ziqi's qin. It also has the rather surprising comment that Ziqi was a small business man. Zhong Ziqi, a man of Chu and a relative of Zhong Yi (#35), was a friend of Boya (#38). When Boya played the qin Zhong Ziqi was a good listener. When Boya was focussed on Mount Tai, Ziqi said, Wonderful, as grand as Mount Tai. 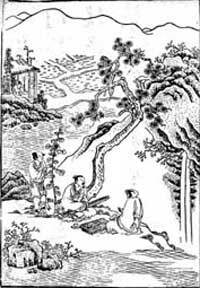 When Boya's focus was flowing streams Ziqi said, Vast and swelling, like flowing streams. Whatever Boya described Ziqi attained. When Boya traveled on the north side of Mount Tai and met heavy rain he stopped below a cliff, took out his qin and played it. First it was Continuous Rain Lament,9 then it was Crashing Mountains Melody.10 Each time he played Ziqi completely understood. Boya then set aside his qin and sighed, saying, Wonderful. When you listen it is like our hearts are resonating together. How can my thoughts escape like this? When Ziqi died Boya split apart his qin, broke his strings and never played again, because at that time there could never be another person who could understand his music. Once when Ziqi at night heard someone strike a bell the sound was sad. When he called the player over and asked why the sound was sad the answer was, My father killed someone and is imprisoned but not yet executed. My mother has been captured and made a slave by a master. I am captured and am playing a bell for this master. I hadn't seen my mother for three years, then last night I suddenly saw her. I would like to buy her from slavery but I have no money, so she is still with the master's family. This is my sadness. Ziqi said, Sadness is in the heart, not in the hands, not in the wood, not in the stone. If there is sadness in the man, then the wood and stone respond to that. This is the reason. 蓋子期於音皆然，非獨琴也。夫志有所存則見於音，君子知其音以逆其志則得焉。或識於斯須之間，或知於千載之下。合若符節，周衰樂散，世罕知者。以伯牙之藝，而獨一子期能知其志。子期死，是以發憤而絕弦也。後之人知其曲者鮮矣。又況察其音亦鮮矣，又況探其志者乎。 Compare this account here to the one with the melody Gao Shan, particularly the quote from the book of Liezi.